When you are managing your files on your server, you may need to delete files off the server. You can delete files several different ways from your server. You can connect with an FTP program like FileZilla and delete files, or you can Use your cPanel File Manager. Below are the steps to delete a file from your server using File Manager and FTP. 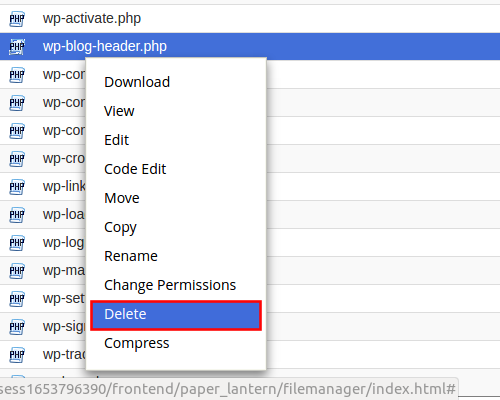 You can use the cPanel file manager to delete files from your server. Below are the steps to delete a file from your server using the File Manager. Go to the File Manager, Select your domain where you want to delete the files and click Go. Navigate though your files to locate the file you want to delete. Right click the file and select Delete from the pop up menu. Confirm the file is deleted. Now the file will be gone from the server..
To delete files using FTP, you can follow the steps below. This will only explain how to delete through FileZilla. Other FTP clients should work basically the same. Open FileZilla and connect to your server. Navigate to the file you want to delete on the server. Right click the file and select delete. Click OK to confirm the delete Now your file is no longer on the server. I have more websites.I would like to upload image to the site through wordpress and I got the following error message:Missing a temporary folder.The reason is probably:The file usage is on full.I don't know what kind of files should I to delete from the server.Can you help me? Unfortunately, we do not have authorization to access your files to advise what can be deleted. However, generally speaking, if you have any extra backup files, download them then remove them from the server. Additionally, if you are a customer of InMotion Hosting, you may reach out to our Live Support for further assistance with maintaining your files. Please may you help me. I have added images to my wordpress site and deleted some. I have been told that I have no more space and to free up space I would need to remove temp files and those I deleted that leave an imprint. You may want to contact Live Support so they can walk with you through the files that need to be deleted. You can tell them which ones and they may be able to go ahead and clear up some space for you. recently i have been blamed by my company that i have deleted files from server and there is no back up with the IT neither IT are able to recover this data, they put allegations that I used a special software to permanently delete files. kindly advise how can i defend my self as I never did any thing like this. Thank you for contacting us. You can possibly review the Server Logs for any record of these files. The 403 error is typically a permissions issue. If you are one of our customers and cannot figure out the specific issue, our Live Support team can reset the permissions on your account for you. I have developed a website using wordpress. Am trying to delete infected files in a folder through filezilla, am getting the "550 could not delete single.php: Operation not Permitted" message. How to resolve this issue. Thank you for your question. I found a similar post in the Official FIleZilla forum, where it was caused by a permission error. I recommend checking the permissions for the files you want to delete, to make sure you have the ability to modify them. If you have any further question, feel free to post them below. I am able to delete files just fine. What I am unable to do is delete empty folders. Is there a trick for this? Thank you for your question. You should be able to delete a file with File Manager, or FTP , as described above. If you are not able to delete a file, you may want to check the file/folder permissions as described here. If your problems persist, please provide more information such as an error message, or details on what happens when you try to delete the folder.